Nodes and links in graphs created by Vivagraph.js are easily modifiable using CSS and library settings. The graph also supports multiple algorithms for arranging networks of nodes. 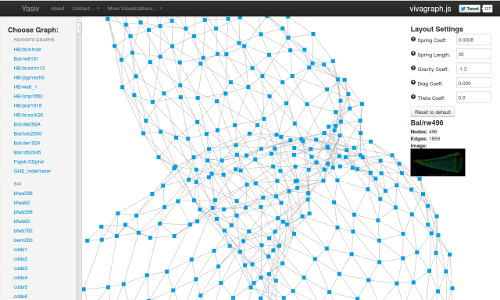 This tutorial shows how to create an interactive node-based connection graphs using Vivagraph.js. It combines Vivagraph.js with a number of libraries, creating an interesting search-application. The tutorial is a bit complex and documentation is a bit sparse, but the idea is interesting and creates a useful, practical application.